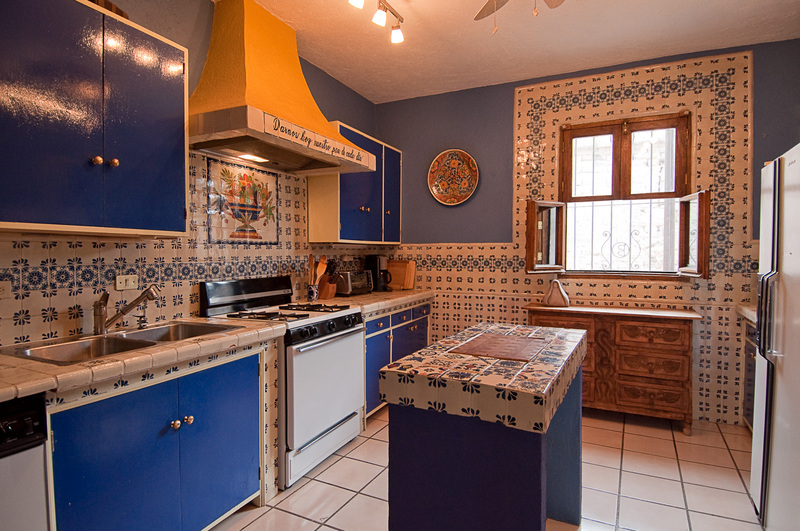 Newly remodeled and refurnished, Casa Catarina is perfectly situated in the center of San Miguel, in between the Jardin, Parque Juarez and the famed Instituto Allende art and language school. With three bedrooms and three-and-a-half bathrooms, this charming home for up to 6 guests also has an abundance of outdoor living space, including a central patio and covered sala on the first floor as well four different roof terraces on the upper levels of the house. A fourth bedroom on the roof terrace level (near the bathroom on that level) is normally locked off - but check with the rental agent to discuss options for making this room available, if needed. Entering Casa Catarina from a quiet side street, you come into the den/study (with fireplace, TV and computer center) and continue into the main rooms of the first floor: a colorful tiled kitchen (complete with microwave oven, toaster oven, blender, juicer and modern appliances) and the living/dining main room with another fireplace. 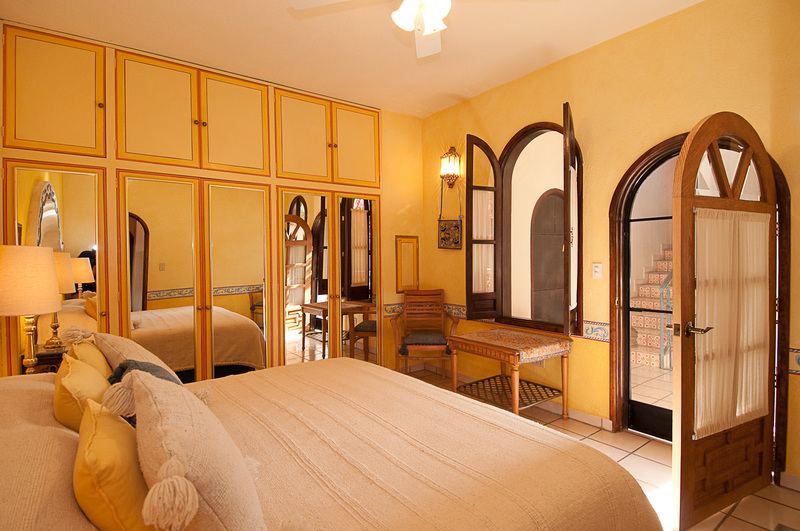 The two TVs in the entry den and the master bedroom are both connected to the Dish network, and you also have a DVD player and CD stereo. 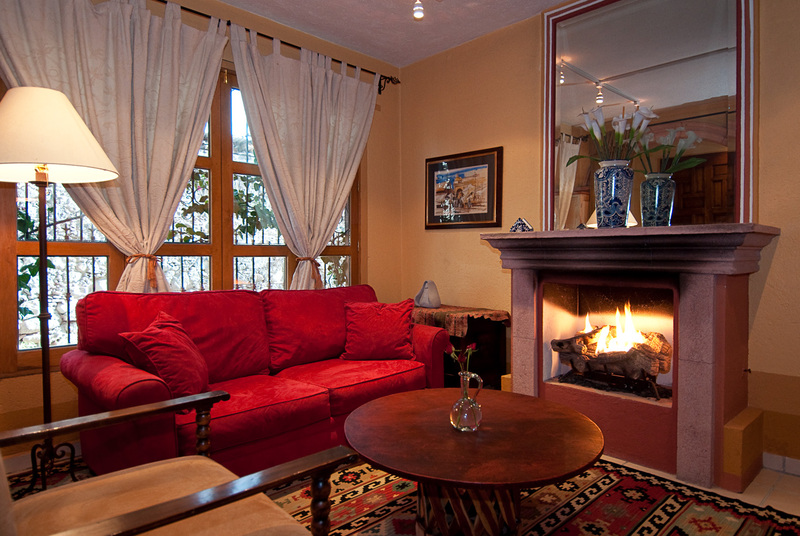 French doors from the cozy sitting area of the living room open out to the covered sala with its outdoor fireplace, traditional leather equipale furniture and a little patio with a stone fountain. 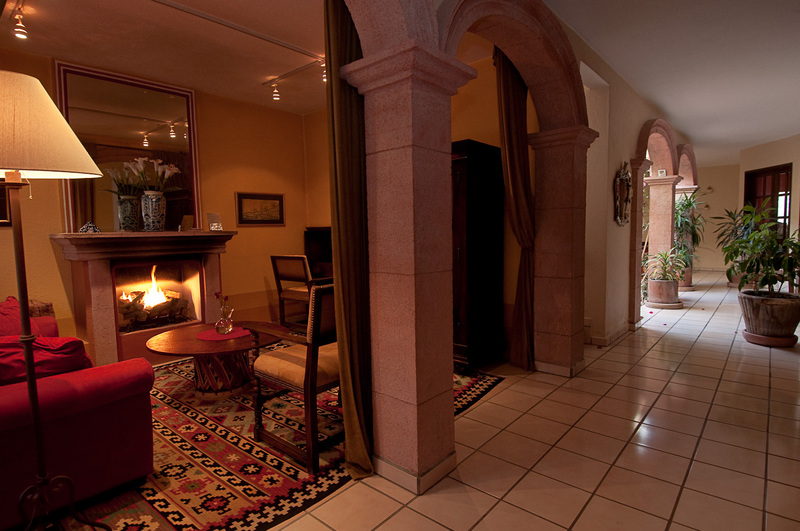 All three bedrooms are located on the second floor of the house. 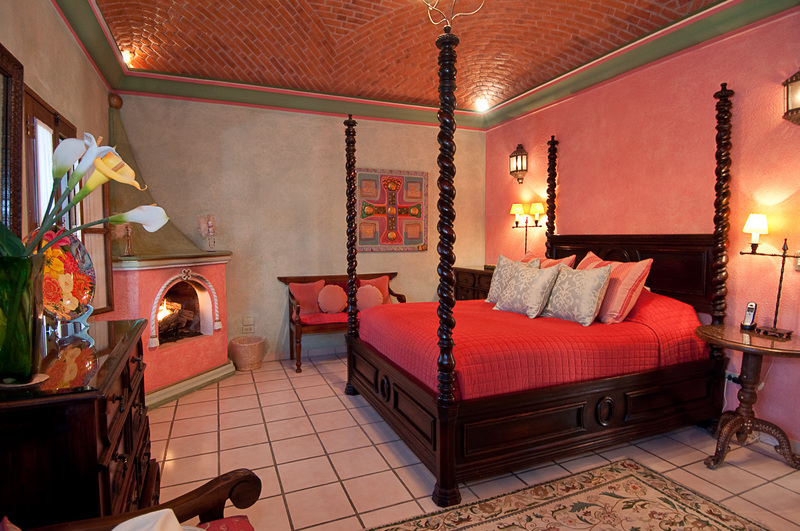 The master suite, with its elegant four-posted queen bed, has its own fireplace and a double-sink bathroom. 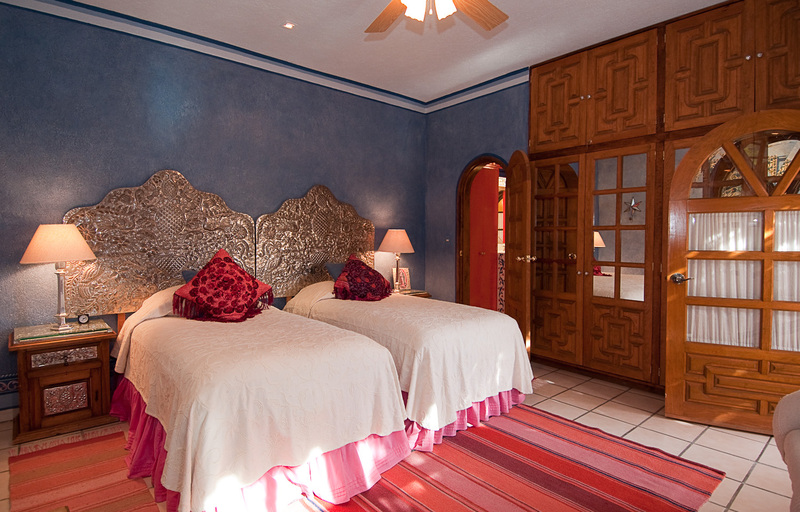 The two other bedrooms share a bathroom, one with a king bed and one with two twins (and these can be combined to create a second king bed, if you wish). 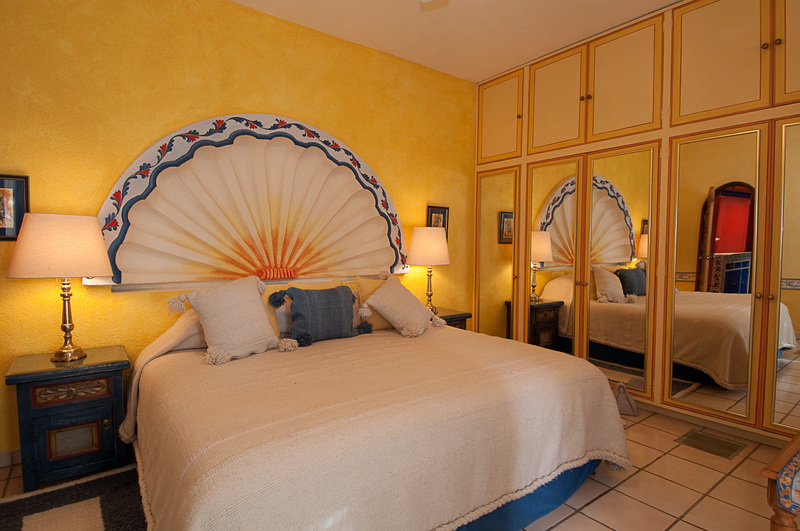 All bedrooms have ample closet space and are fully equipped with either electric blankets or down comforters for those sometimes chilly nights. 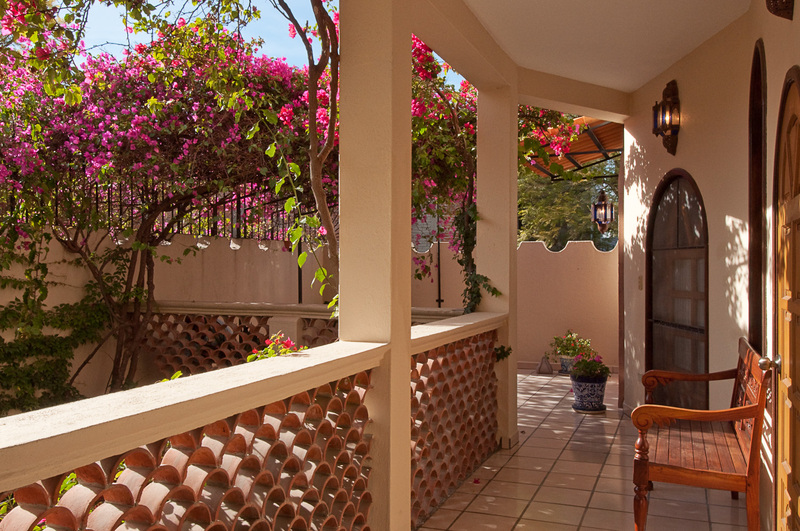 The twin-bedded room opens out to a bougainvillea-covered terrace, the perfect place for that morning cup of coffee before your day in San Miguel gets started! 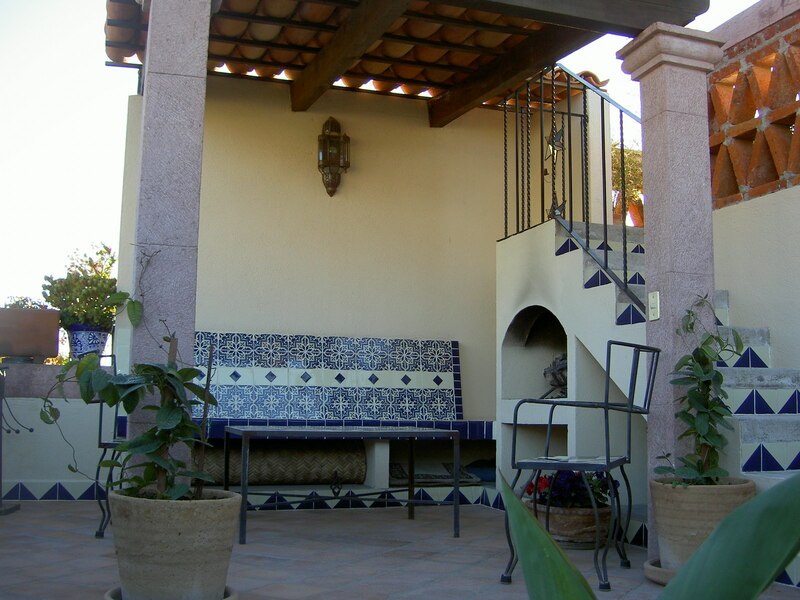 Up one more flight of stairs and you are on the first level of a three-tiered roof terrace. 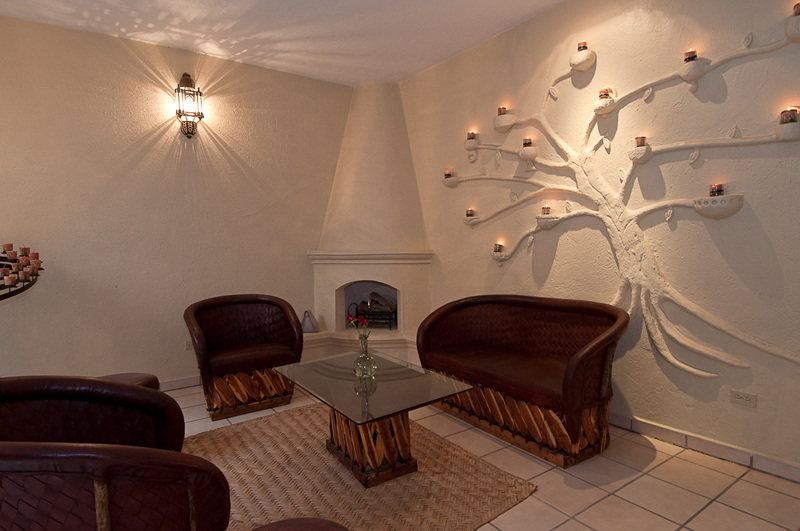 The first tier has a private covered area with a lovely fountain. 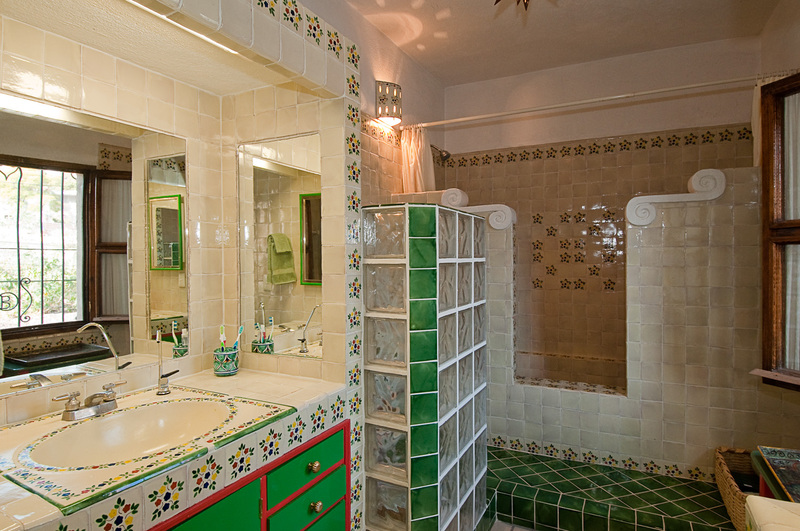 This level also includes a full bathroom and a separate laundry, and there is a dumbwaiter to bring food and drinks from the first-floor kitchen to the upper roof terraces. Enjoy food and drink on the upper terraces with only a pull on the rope! 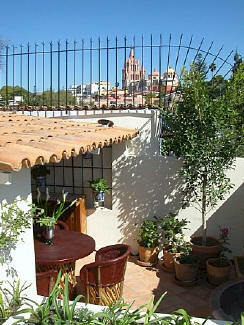 Note: There is a fourth bedroom on the roof terrace level which normally is locked off. It is possible to add this bedroom (near the bathroom on that level) to have accommodate rental groups of up to 8 people. In this case, the cost of the extra bedroom is $500 USD/week, to add onto the rental rate listed below. 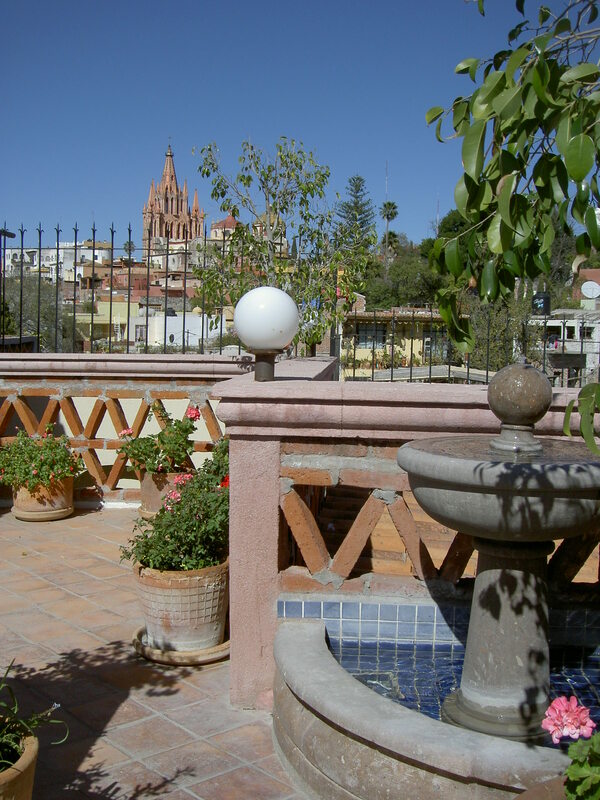 The two additional tiers of roof terrace have more sitting areas as well as yet another fireplace - and both have drop-dead views of the Parroquia church, the heart and soul of San Miguel. 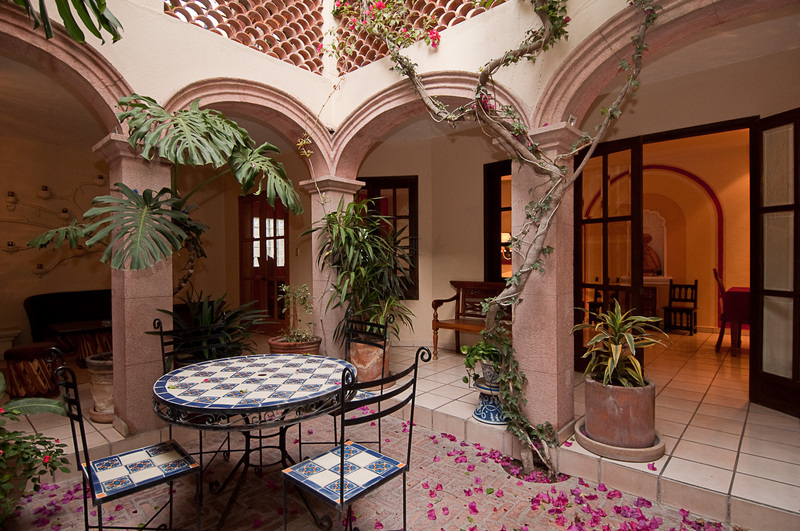 You will love sitting up under the stars here, or watching the sunset over the western mountains, while admiring the rooftops and spires of the old historic Centro all around you. 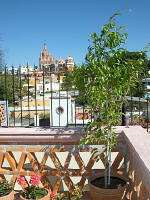 A neighborhood bonus: Next door to Casa Catarina is a little local bar that can provide margaritas and snacks to go. Pick up your drinks/hors d'oeuvres and enjoy them during your cocktail hour on Casa Catarina's roof terrace with a view! 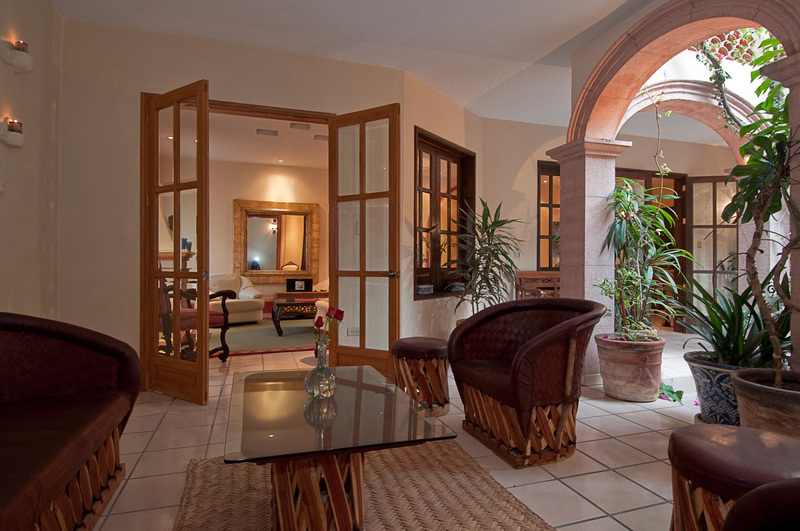 Casa Catarina provides high-speed Internet access and a Vonage (Voice-Over-IP) phone line for free calls back to the U.S. and Canada. Regular maid service is included in the rental fee, with the maid coming Mon - Fri, from 9 am to 2 pm and from 9 am to noon on Sat. Although the maid's primary role is to clean and do simply laundry, she also is a good cook - and she can do light cooking for an extra fee of 50 pesos/hour. 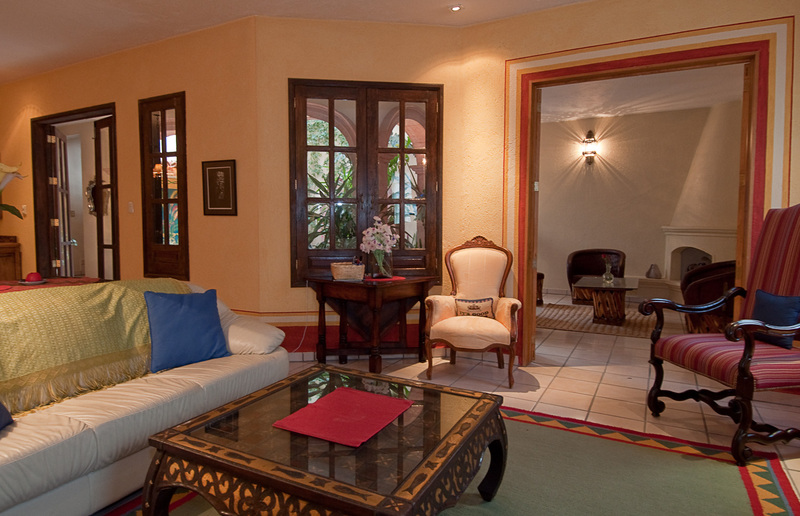 Children older than age 12 are welcome at Casa Catarina, with a limit of two children per rental group.